The book ["Whole Lotta Led Zeppelin,"](https://books.google.com/books?id=Q6d41Yu-nUsC&pg=PT128&lpg=PT128&dq=jimmy+page+herco+flex+75&source=bl&ots=bCz6QcnatQ&sig=tzBEtDqfWh91l33GX-W3LgOXGzE&hl=en&sa=X&ei=MRX3VP_eOPOHsQSwuoL4BQ&ved=0CEsQ6AEwBzgK#v=onepage&q=jimmy%20page%20herco%20flex%2075&f=fa) by Jon Bream, Robert Alford, and Charles Auringer, states on page 164, "He [Page] preferred heavy-duty Herco 75 picks." Urban's guitar tech, Chris Miller, says that Keith holds the Herco picks sideways, it grabs the strings more and gives a specific sound. It is part of Urban's signature sound. Has been known to use them since his early days with Pink Floyd. A signature version was custom made for Gilmour in 2015. Mentioned on Jim Dunlop website as a common user of these picks. "I have to have a thicker pick with a grip. 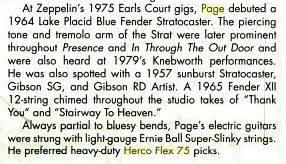 I use the silver Hercos .75mm ones, like Jimmy Page." Mark uses Herco Flex 75 picks. I'm always going back and forth between these and the Dunlop Tortex 73s. These are more suited to lead-guitar and bass playing while the Tortexs are better for rhythm playing.